The Memphis Ultimate 4 in 1 Smoker Grill Combo from Pit Boss is a beast of a machine that is actually quite pretty. I had the chance to review one of these first hand at a Big Box store and walked away both impressed and confused. 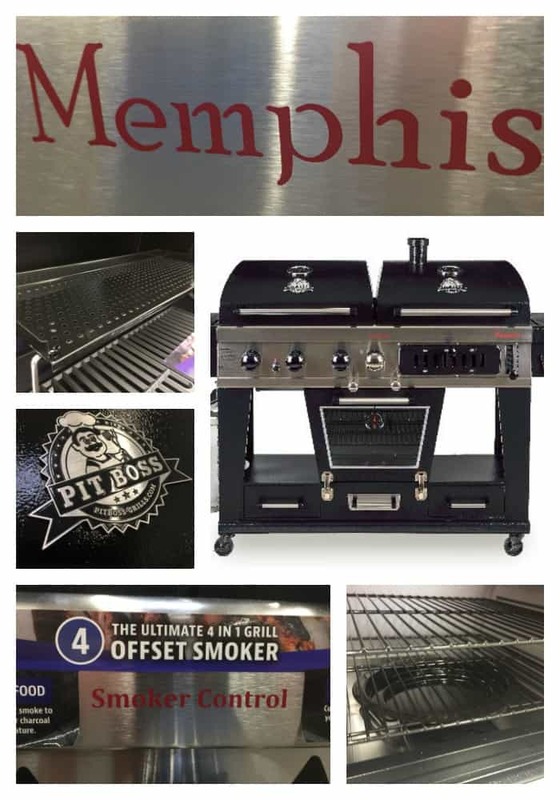 The Memphis is a grill and smoker combo unlike anything the market has seen before. This beast has a full size gas grill, a full size charcoal grill and an electric smoker! And that is the one thing that had me confused….those are three different ways of cooking. What was next one that makes this a “4 in 1” grill? I checked the Pit Boss website to see if they could shed any light on the issue. Pit Boss calls it a 3 in 1 combo. I have a couple of ideas about that fourth cooking option but let’s not worry about it right now. Let’s take a look at the three main cookers you get with the Memphis. 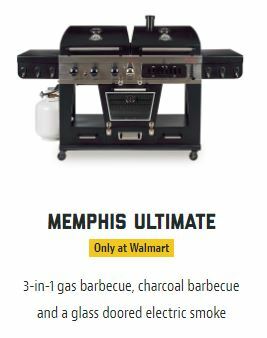 The left side of the Memphis is equipped with a full sized three burner gas grill. 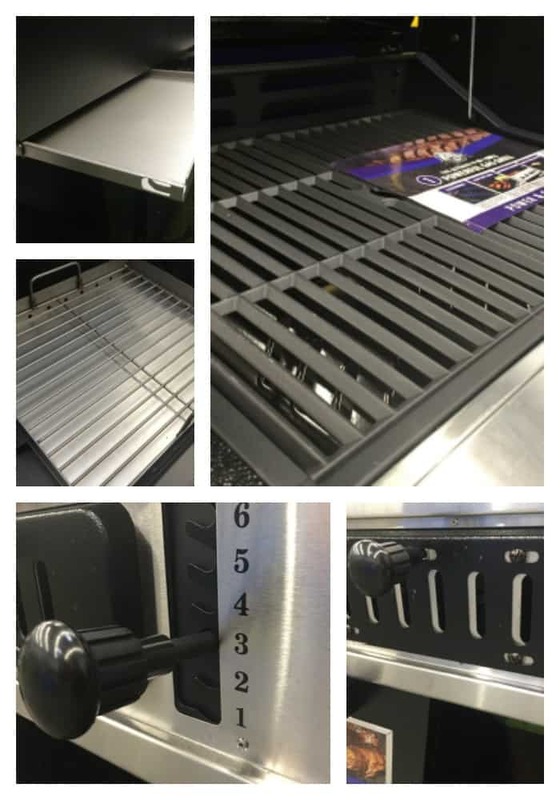 The gas grill offers 36,000 BTU/hr and, when the warming rack is included, has 663 square inches of grilling space. The grates are heavy duty porcelain enameled cast iron and the burners are covered with some reasonably thick Flame tamers that look like they ought to actually work. The grease tray is accessed from the back of the grill which is a bit of a hassle. The right side of the Memphis is equipped with a full size charcoal grill. The charcoal grill has the same grates and is the same size as the gas grill. A nice added feature on the charcoal side is that the height of the tray that holds the charcoal is fully adjustable. You get a lever that lets you choose between six different height settings. You could set the lever at the “6 setting” and have the coals directly underneath the grates for some serious searing. You could then drop it down to the “1 setting” if you wanted to cook things a little slower. The air intake control is located on the front face of the grill and slides over a series of oval air vents. 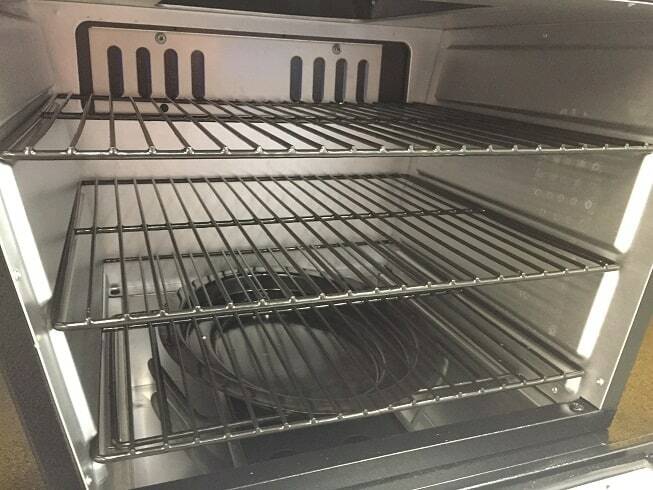 In the center of the Memphis, located below the gas and charcoal grills, is a small to medium sized electric smoker. 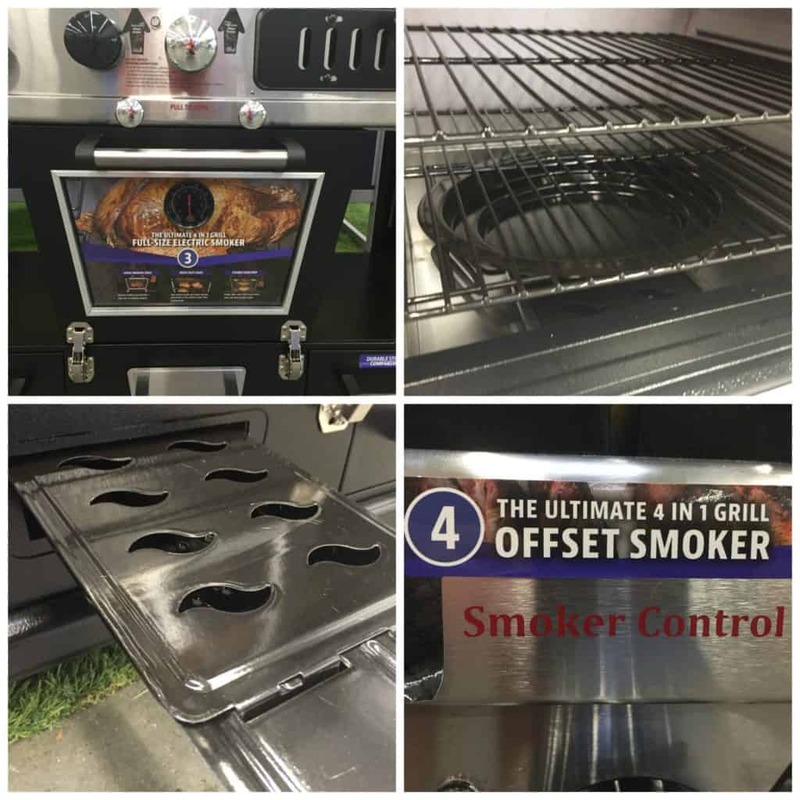 The smoker has a unique 1,500 watt heating element that wraps around the sides of the wood chip tray. There are a couple of issues with the smoker but it also comes with a nice surprise. 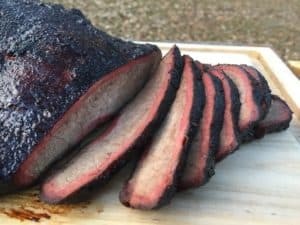 The first problem with the smoker is that while it is advertised as having 840 square inches of space that is spread out over three cooking racks. This is not a large smoker and you will not be cooking as many ribs in here as you think you will. The second issue with the smoker is that it has an analog control. 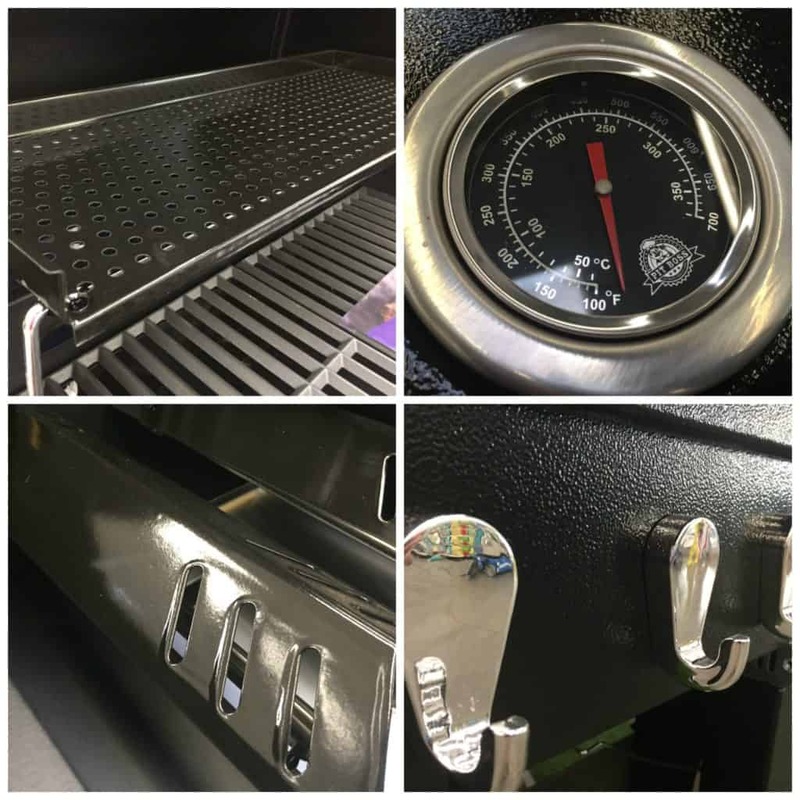 The control knob is a big silver dial in the center of the grill that doesn’t even have any “High, Medium or Low” settings. It will take you a while to figure out where to set that dial to get the temperature that you want. The third issue is that the water pan is located inside the main cooking chamber. If you want to refill it while you are smoking then you are going to have to open the door and let all of the heat and smoke out. None of these issues are deal killers but I did want to make sure that you knew that as far as electric smokers go that this one is not a high performance model. Despite it’s short comings the electric smoker comes with a nice surprise. In between the main control knob and the smoker are two silver knobs. If you pull the knob on the left then it opens a damper and lets smoke from the electric smoker exhaust into the gas grill. Pull the knob on the right and smoke will vent into the charcoal grill. This is a great way to add some smoke to whatever you are cooking on the gas grill. It is also could probably be used as a cold smoke generator for the charcoal side of the grill. What About the Fourth Option? I have two ideas about the fourth cooking option that would make this a “4 in 1 Cooker”. 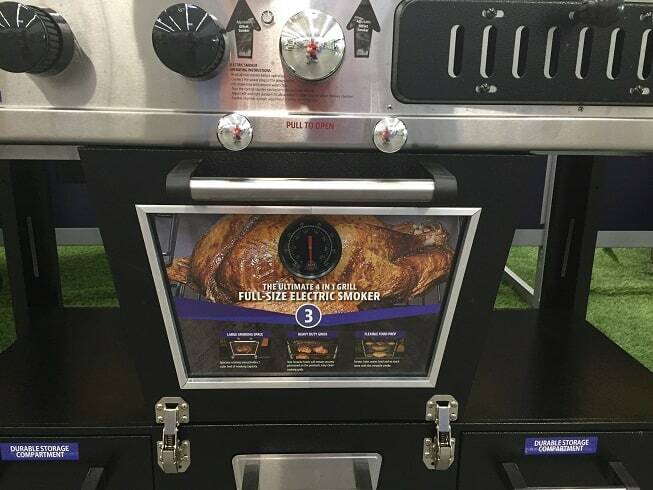 The ability to vent the smoke from the electric smoker into the grills might be the fourth cooking mode that makes this a “4 in 1” unit. Another idea for fourth option comes from the product description on the Wal Mart website. Despite what it says, there is no infrared searing burner on this grill. I will bet you a nickel that the initial design specs for this grill included an infrared searing station side burner. That would be a killer idea and it is just about the only thing missing from this grill other than a rotisserie. I suspect that somewhere along the way the design got changed, the infrared burner was dropped and nobody told the Marketing department. 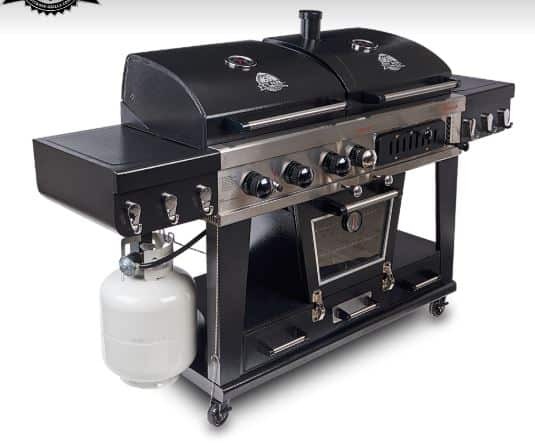 I received a reader question about the size of this grill and figured the information was worth sharing with everyone. The grill has a length of just over 74 inches with both side tables in place. 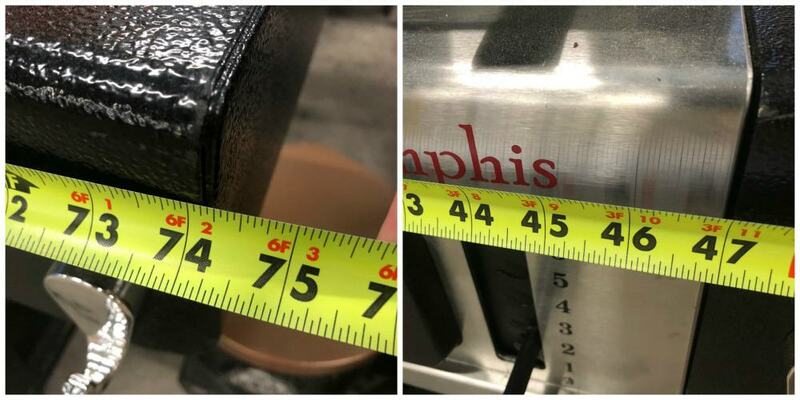 If you remove the side tables then the grill is just a little over 47 inches. Usually I think that “all in one combo packages” are inefficient wastes of money. This one might be too but I don’t care. The Memphis looks like a beast, has an adjustable charcoal grill and has a built in cold smoker. Here is a video review of this grill by a guy that has been using it for several months. He is a happy camper. Hi there, do you have the dimensions of the grill without the side tables? We love this grill by have a built in spot in our outdoor kitchen of 48 inches. I just checked the dimensions and you are in luck! Without the side table the grill comes in at just a fudge over 47 inches. I added a picture in the article for you. Something to be aware of is that the plug for the electric smoker and the grease trays for both grills are in the BACK of this grill. If you use this as a built in then you will need to pull it out from time to time to access the back mounted components. Thank you for sharing your experience, Anne! I lined the smoker pan with tin foil. It help with how fast the water boiled off but still introduced moisture to the smoker so nothing dried out. Perhaps the 4th option is to use the smoker without wood chips as an oven? That is as good of as guess as any, Jeff! Can you use both gas side and charcoal side at the same time?